I can hardly resist a multitasking beauty product, especially a drug store product at a really good price. I'm an avid traveler, and being able to bring something that can do the job of three different products is a great plus. I still remember when I first spotted and bought the Garnier Fructis Pure 3 in 1 Wash Scrub and Mask, I was hesitant that this little face wash product could promise so much. But even so, I thought it was still worth the review and the try - especially if it turned out to be a hidden gem... And so it did! For a 3 in 1 product, the texture is firm yet creamy with small exfoliated beads/particles. It's gentle-feeling but very exfoliating, the longer you massage it in the more exfoliating it is, the less time you massage it in the less exfoliating it will be. As a mask, it hardens in 3-5 minutes. akin to a clay mask, and it's easy to wash/wipe off. The packaging is standard, squeeze packaging, which is great for a product with this texture. Price-point is very good for this 3 in 1 gem. I believe it was around $11-15CAD at the pharmacy. The product is indeed a gem, with everything else fitting well: price, packaging and texture, this 3 in 1 product can be used as a wash, exfoliator and mask. I want to make a small mention to the light medicinal scent it has: I would've preferred something like light mint or lemon but since smells don't particularly bother me, I can still use it. To be honest, it can't be used as a wash without exfoliating, so personally, I find it to be a 2 in 1. The scrub portion of the product is great if you have acne-prone or light acne on your skin - I love it for my combination, hormonal acne prone skin. 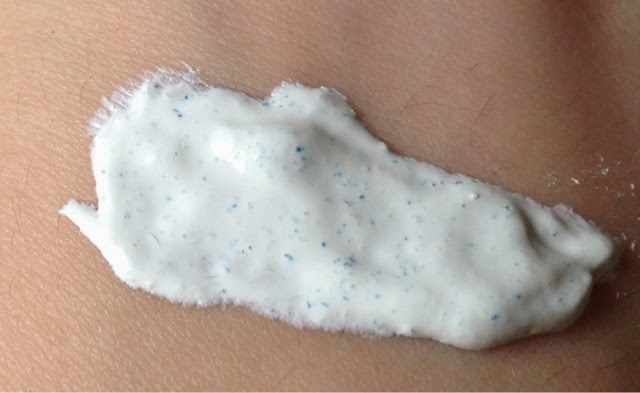 As a scrub, it has tiny white and blue exfoliating beads the pop through the white cream colour of the wash. If your skin can't handle daily exfoliation, I wouldn't recommend this as a daily product. The mask is great too: it's a super short mask, 3-5minutes, and I can pop it on in the morning after a breakout and it instantly calms my skin down for the day. Would I repurchase? I would! It such an easy product to use and travel with that I find it handy to have around, plus, who can resist the price tag?